Is this the best pizza in Melbourne? Apparently so, according to the sign on the blackboard next to the specials. And I have to say that the one we did have was very good. 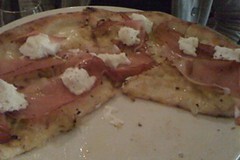 Definitely try the Tirolese pizza topped with shredded leek, mascarpone and speck. Served on a lovely artisan style base it had exactly the right amount of chew. It didn’t hurt that the open kitchen is full of good looking young Italian chefs to add an extra dose of authenticity. 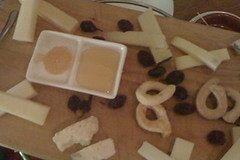 We also ordered the cheese degustation, served on a wooden board with 7 lovely aged Italian cheeses. The service staff are a little on the unpolished side – we noticed when our neighbours sat down to order that they were offered a list of specials which would have been nice to have as an option when we had ordered. Also our cheese board came without any crackers, and when I requested these from the waitress, she had no idea what they were, so we prompted for some bread instead which took some time to come out. 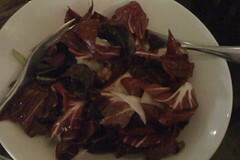 Another miss – raddichio salad with pear, walnuts and parmesan came sadly lacking in the pear, walnuts and parmesan department. Overall though the pizza was excellent so will definitely be back.